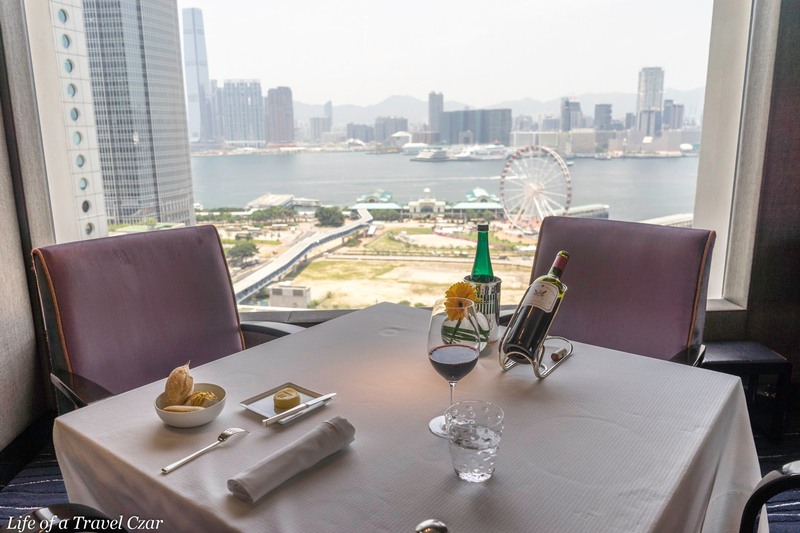 Pierre Restaurant is situated on the 25th floor of the Mandarin Oriental hotel in Central, Hong Kong. 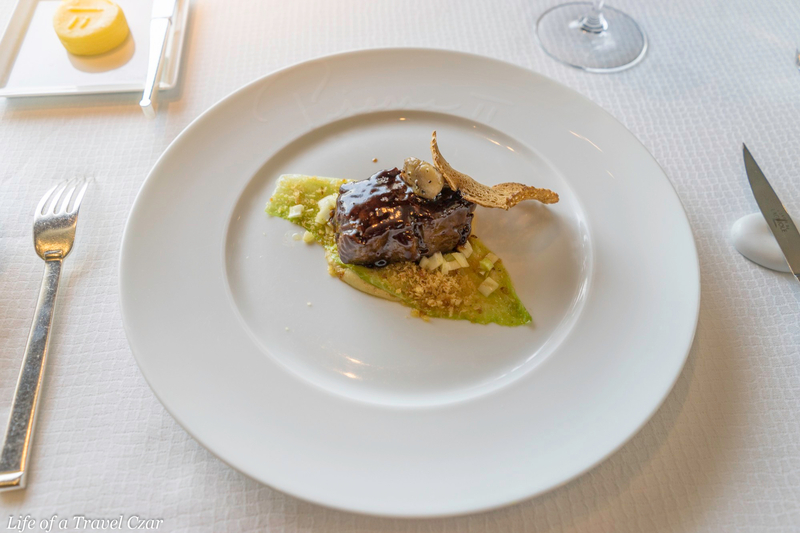 The restaurant has two Michelin stars and is headed by French culinary genius Pierre Gagnaire. 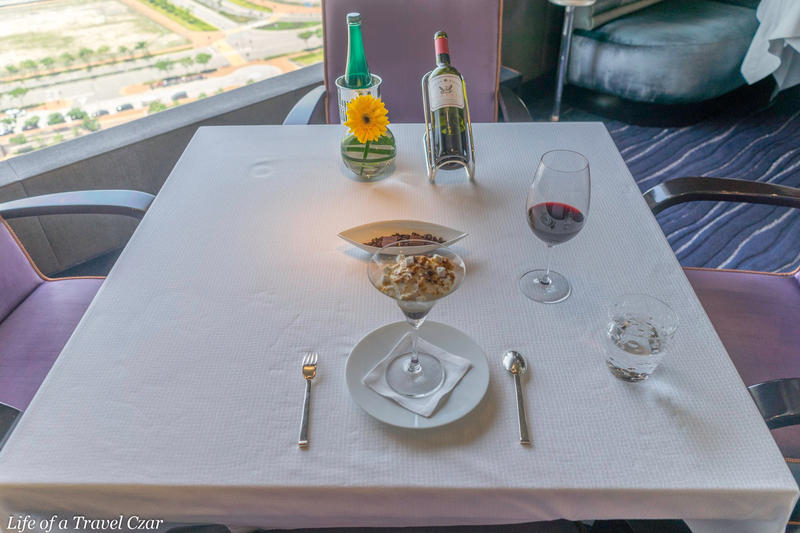 The restaurant’s Chef de Cuisine is Jean-Denis Le Bras. The dining room has well spaced tables covered with linen and oversized luxe purple chairs with a central sunflower piece. It’s minimalism, classic, chic and quite a contrast to some of uber high-end restaurants which have palatial fittings. The tune is from Splice App – My Miami. I do not own the rights to this song. 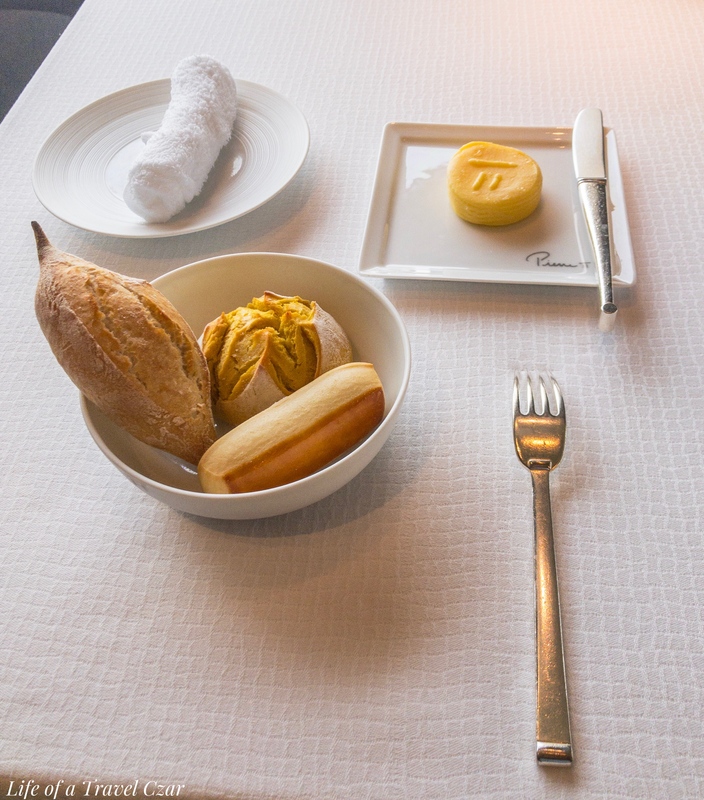 The waiter provides some freshly baked crusty baguettes, paired with a nicely shaped circle of French butter. Next we have the amuse bouche, which today is three bites. 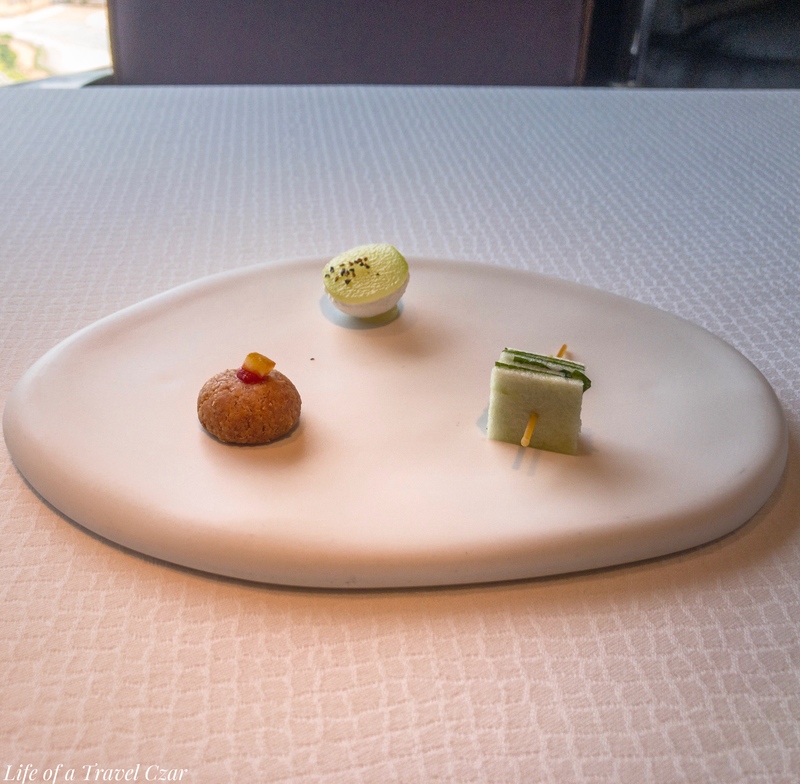 There is the hummus cheese biscuit , the gin and tonic taster and the green apple bite. All of them do provide a nice burst of flavour to whet the palate before the afternoon proceedings commence. I peruse the wine light for an appropriate drop to accompany me through the afternoon and I settle on a lovely wine from South Australia. 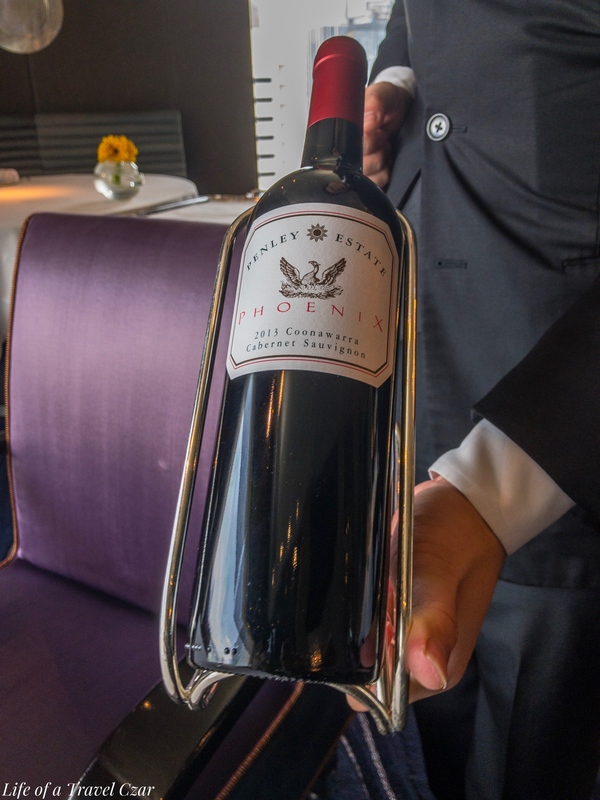 Penley Estate, Phoenix, Cabernet Sauvignon, (2013), Coonawarra, South Australia. On the nose there is a complex bouquet of black forest berries with a hint of chocolate. On the palate the wine is more a classic Coonawara Cabernet with beautiful red and black fruits flavours notably blackcurrants. The fine tannins provide a beautiful and harmonious texture. On the initial pour, the bite of acidity and oak bite is quite firm, but it does dissipate noticeably as the afternoon wears on. In the finish there are hints of herbs and bitter balsamic notes which have crept in. As the wine is poured I do reflect on the beautiful view outside the window as the afternoon unfolds. The tune is from Splice App – Reign of Love. I do not own the rights to this song. Then the waitress brings out the entree which looks quite alluring. Foie gras velouté, Rhubarb marinated in sweet spices. 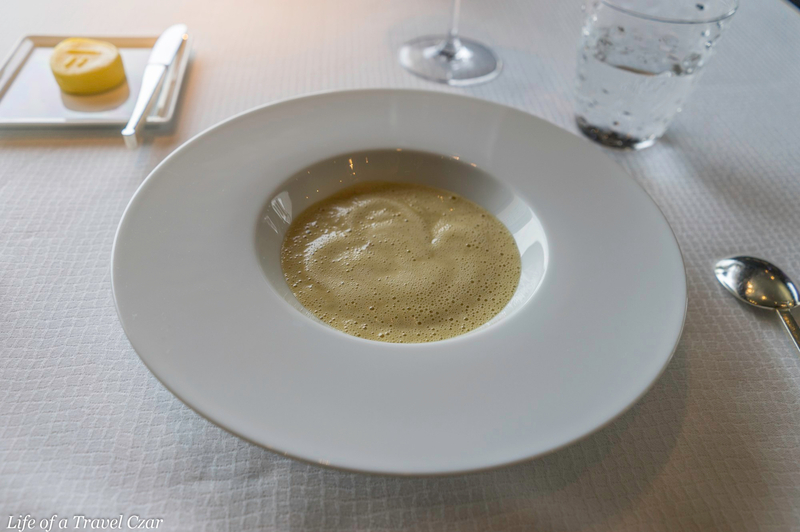 The foie gras veloute itself is lovely – the creaminess of the foie gras with its rich buttery texture and flavours is a treat. 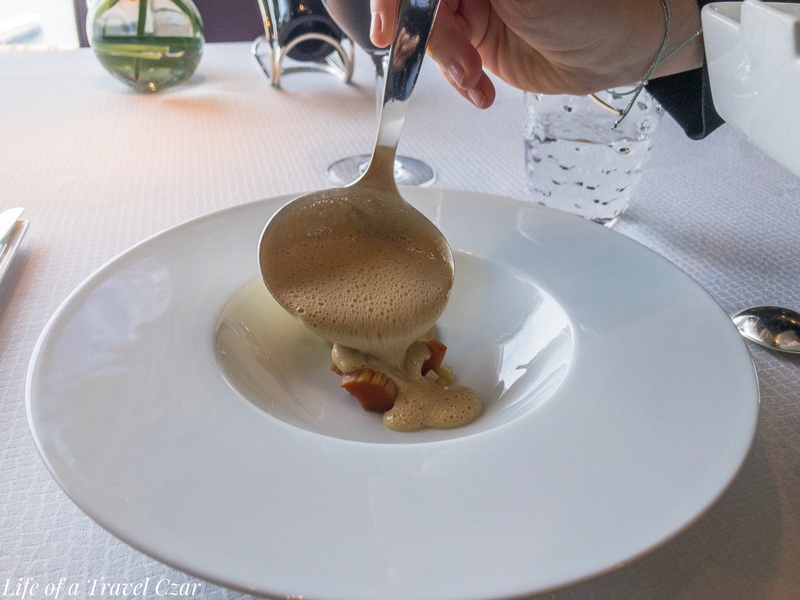 While the sweet spices which marinate the rhubarb imbue the foie gras veloute which a lovely eclectic flavour, the rhubarb base doesn’t quite hit the spot. So, I focus on scooping spoonful’s of the veloute and avoid the rhubarb – it is a nice way to start the afternoon – with a touch of richness but airy lightness at the same time. The acidity in the wine and sweetness was perfect for the foie gras. Grilled beef entrecôte, fennel mousseline, veil of spring cabbage, bone marrow toastt; Red wine sauce. The beef is a gem – it’s wagyu beef from Australia. I chuckle that I have flown 7,000kms just to have a Wagyu Beef from Australia paired with a Cabernet Sauvignon from South Australia. Our lives are embedded in acquired tastes, formative experiences, familiarity and our childhood experiences. The beef is tender and prepared perfectly. There is the beautiful sticky red wine sauce, the smoky charred outer portion of the beef and the beautiful tender juicy middle portion. and the creamy fennel mousseline adds a nice the cabbage provides a green aesthetic. The smoky marrow is rich and buttery on the tongue while the crunch of the toast adds an extra touch to the dish. The tannins and richness of the wine proves a perfect pairing for the wagyu! This is quite a mix of eclectic flavours – it’s a mix of flavours in a martini glass. There’s an espresso streaky coffee and whiskey panna cotta, then there are little jelly like Guinness beer layer, a chilled yoghurt sorbet which is then laced with a creamy milk foam. The strength of the whisky and coffee in the panna cotta gives me a little “wake me up”. The dish does well with its textural contrast with the creamy elements being balanced with the jelly, fluffy and crunchie bites sprinkled through. The top layer of the milk is burnt for a smoky touch which is lovely. It’s a dessert with a light feel but you definitely taste it’s richness. 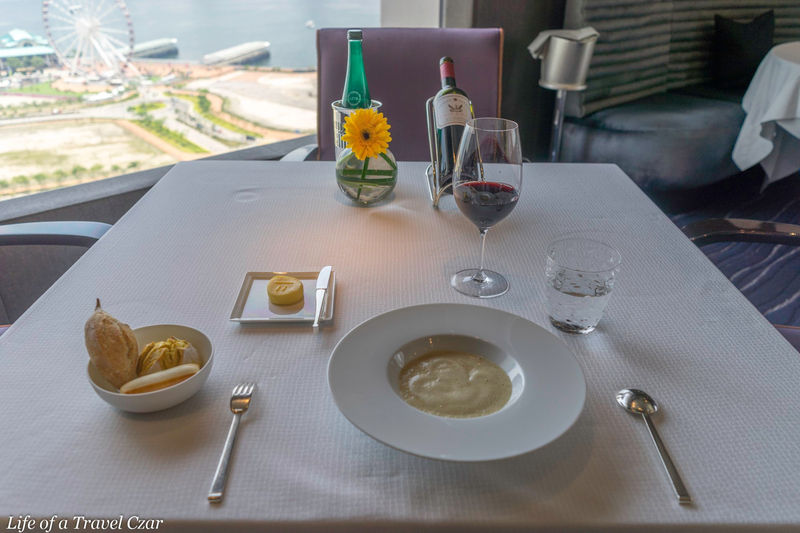 The culinary style of this restaurant is quite something – I have to say the approach was very French and certainly hit mark in terms of the ingredients. Although the rhubarb in the foie gras veloute was a miss, I couldn’t fault the beef or the dessert. The wine list was quite extensive with some good value options which allow me to choose a bottle to sip on over the afternoon and the service was just so overly attentive. 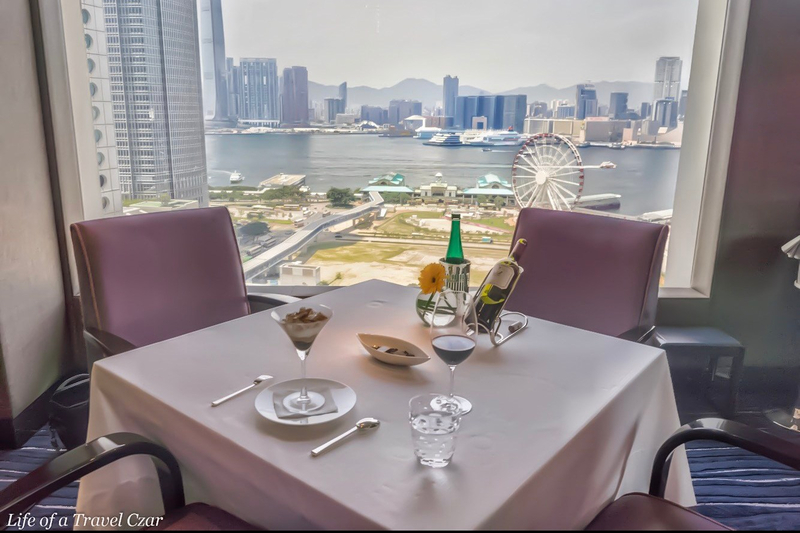 The view of Victoria Harbour was stunning and its location in Central with the Ferris Wheel and the open areas made it just perfect! 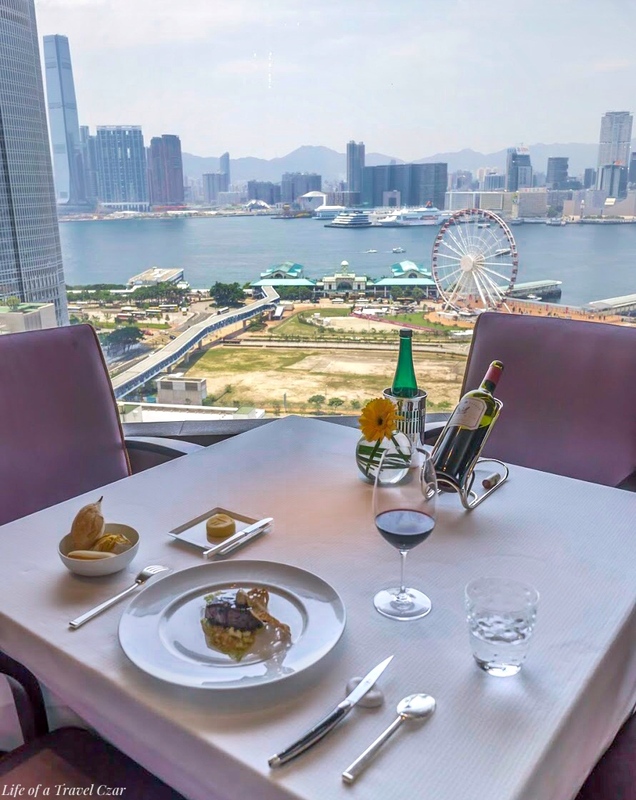 It differed in its ambiance from Restaurant Petrus (see review here) in that it was less palatial and more business chic. It’s location meant it was more a business style crowed in for a quick lunch relative to the leisurely lunch set. Nonetheless, it was definitely the way to spend a leisurely afternoon in Hong Kong.